Scheduling software is a very important tool for companies where it can have a significant impact on productivity. In manufacturing, the purpose of scheduling is to trim the production cycles and minimize costs, by generating a detailed production plan where resources and time required to complete jobs are optimized. It preserves the operation sequences in the considered interval. Scheduling considers a short time horizon (much shorter than planning), usually ranging from days to weeks. The input are manufacturing orders with all the information necessary to make the product (resources and operation steps). The output is provided using graphic (gantt and pert charts) or text based printouts (spreads and lists) where timetables and cycles are in evidence. If you are looking for a gantt with special graphic effects, you will find a wide range of solutions on the net. But, if you need a real scheduling engine, your opportunities will dramatically drop down, and our solution will shine like a diamond in the sky! Handling of dead zones (areas where resources cannot be scheduled) or scheduling conflicts (incompatibility of an activity with another on one or more resources) can become a real nightmare: our component automatically takes action to solve them (much more than generating some kind of alert) ! Our scheduling components are suitable to build production scheduling, rosters, TV scheduling, car/room rental and many other applications! 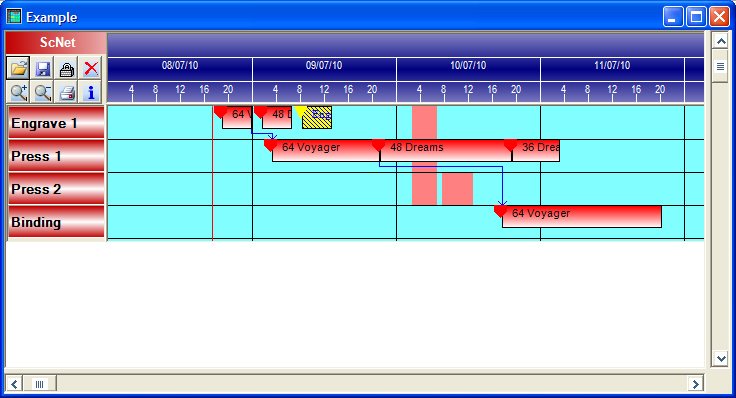 Custom Scheduling Software in order to meet your specific needs. We engineer custom software using our experience and resources (heuristic algorithms, forward/backward scheduling, components). Contact us for more information. Scheduler Net Our latest .Net scheduling component takes care of everything: scheduling, presentation and printouts are carried out by the component, the developer has to input only resources and job data. Scheduler Pro Our powerful scheduling component takes care of everything: scheduling, presentation and printouts are carried out by the component, the developer has to input only resources and job data. If you are interested to buy the component source code , simply contact us! Planning software can dramatically increase the horizon of companies. In manufacturing, the purpose of planning is to manage overloads and to monitor available capacity by generating a load/capacity report (in hours) with reference to a specified time gap (days, weeks, months). It does not preserve the operation sequences in the considered interval. Planning deals with a long time horizon (much longer than scheduling), usually ranging from weeks to months. The input is not limited to manufacturing orders as it may consider data from other sources (such as offers that could become orders). Custom Planning Software in order to meet your specific needs. We engineer custom software using our experience and resources (algorithms and components). Contact us for more information. Chart Pro This control can receive the capacity and load from the SchedulerPro control and take care of everything else: the developer has only to write some code to link the available data. Data collection software can provide the job progress in real time. In manufacturing, the purpose is to eliminate errors, delays and manual data collection. The input may be provided by counters (plc), digital signals (optoisolated relays) or files/messages (JMF) on production lines. The job progress is provided to any interfaced application. Custom Data collection Software in order to meet your specific needs. We engineer custom software using our experience and resources. Contact us for more information. Counter Pro This customizable component can receive the progress from any supported device/file and share it with any interfaced application: the developer has only to use the available methods to get the progress information of any specified production line. Scheduler Net Powerful .Net component with an amazing scheduling engine for any WinForms application (including but not limited to Visual Studio). Scheduler Pro Powerful Com control with an amazing scheduling engine compatible with all ActiveX containers (including but not limited to Visual Studio, VB6 and Access).